We go to great heights to satisfy our customers! Call today or schedule a consult to decide what plan is right for you. Most homes in Florida will eventually experience activity with rodents or other animals like possums or raccoons. Rodents like rats and squirrels have sharp teeth and can gnaw openings from your roof to gain access to your walls and attic. Rats can fit through an opening as small as a quarter. Unfortunately, rodents can live in your attic often undetected. Squirrels usually travel along the outside soffit, which is vented and therefore cooler, and rats are very stealth and can breed in your attic without you hearing any noises. Once in your attic and walls, rats and squirrels can be very destructive by chewing holes in water pipes, electrical wires, alarm wires and your air conditioning ductwork. Jim Reinhardt has spent over 30 years in the pest control industry, and has developed many unique techniques for eliminating rodents and other animals from homes and businesses. It all starts with a thorough inspection of the roof and perimeter of the structure. Then, video cameras are often placed in strategic locations to learn what animals are present, what entry points they are using, how many animals are active and when they are coming and going. The video cameras are weather proof, work extremely well in night conditions (infrared night vision), and capture motion-activated video files. Scroll to the bottom of this page to see some of our sample videos. Many pest control companies rely on rat traps for trapping. 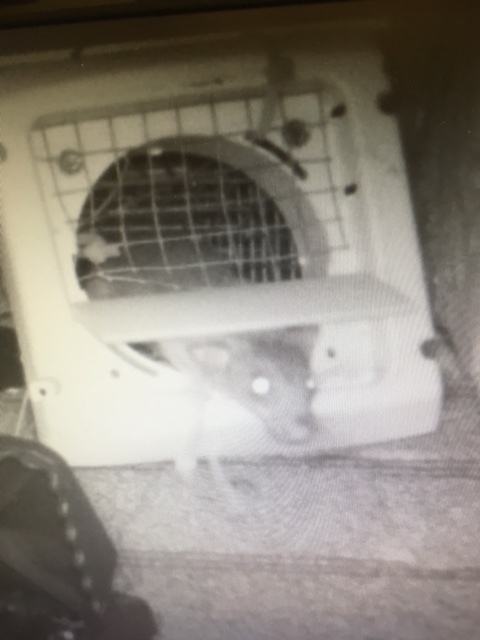 Unfortunately, rats are often very shy of traps, which often results in many service visits with unsuccessful results. Our goal is always to eliminate the rodent activity as soon as possible, so that the openings can be permanently sealed up to prevent future infestations. Through trial and error, we have manufactured one-way doors that can be installed over openings that will allow rodents to leave but not return. This technique eliminates the need to kill the rodents and often gets the job done much sooner, resulting in lower prices for our customers. Over the years we have gotten to know our competition well. Unfortunately, some companies will misrepresent what work needs to be done, will play on your emotions, and provide pricing that is often extremely high for the amount of work to be done. We know you are not going to climb all over your roof to inspect our findings and completed work. Therefore, we take pictures of all the recommended rodent proofing repairs (before and after). We also will be glad to share our monitoring videos. Here are just a few of the ways we outshine the competition. Dr. Jack’s Wildlife management services are designed to quickly locate how the animals are entering, helping them to leave the structure and not return with our one way doors, verifying their exit with motion activated video cameras, and finally securing the openings to prevent their return permanently. A+ rating with the Better Business Bureau of Central Florida. Our customers also have a lot to say about us- find out what people are saying about Dr. Jack's. Dr. Jack's is a local, family-owned company in business since 1972 and not a branch of a large corporation. Our focus is on customer service and understand that serving our customers is our only priority. This philosophy seems to be lost with large corporations today that seem to focus only on the numbers. Lawn sales and customer service from graduate horticulturists or technicians only (no salesmen on commission that you will never see again once you begin receiving service). Our horticulturists are continuously researching and testing new products that keep us an industry leader in service quality. We utilize EPA recommended IPM pest control program that helps protect the environment by reducing pesticide use. Lower annual cost with our bimonthly (every other month) lawn care service than competitors that charge less but service more frequently. We also give $25 credit for referring new customers (most of our new business is from referrals). We do not require or try and sell unnecessary services like aeration in order to boost our profits. We offer non-binding agreements for residential services so our customers can pay month-to-month. We go the extra mile to make sure we are as effective as possible when servicing your property. Our lawn trucks are custom designed for Dr. Jack's to provide both lawn and shrub care with the same visit. We offer turfgrass replacement guarantee for insect damage. We take care of our customers first in these ways and much, much more! It takes work and we specialize in Central Florida lawn and ornamental plant horticulture. We believe that there is not a more professional landscape pest control company than Dr. Jack's — because no other company has college degreed horticulturists (certified lawn and plant experts) that will come out to your home or business to measure your treatment areas and provide a free quote that includes a detailed analysis. Other companies may "high ball" you to see if you will buy at an inflated price and then call you back with a new lower "special price" if you didn't purchase their service with the initial sales visit. Our horticulturists are on salary, not salesmen on commission like other companies. We feel that this is important so that we can take the time to carefully evaluate each prospective customers site and provide a fair and competitive price the first time. With Dr. Jack's, you always get professional, knowledgeable and truthful analysis free of charge without a lot of sales pressure. You may notice that we display the technician's name on their truck and their service years with Dr. Jack's on their uniforms. We are proud of the fact that our lawn technicians have been with us an average of 8 years! There isn't much they haven't seen or treated during this time. High employee turnover is not good for our customer's landscapes so we strive to hire the best people we can find and then keep them. Most of our customers have had the same technician since they have been with our company. Your technician will get to know you and your landscape. Contact us today to experience the Dr. Jack's difference! When you add it all up, why use anyone else? Our prices are competitive and when you add all the benefits included with our service, there is no better value or professional lawn care company than Dr. Jack's. Contact us now for your free quote and experience the Dr. Jack's difference! "Our first experience with Dr. Jack's was beyond fabulous! Samuel Bernal was professional, knowledgeable, committed, patient and a perfect gentleman to boot. We are impressed with the responsiveness of the staff but most of all we have been impressed with the quality of service.....If only all service providers lived up to Mr. Bernal's and Jack's standards." "Our lawn looks so much better than it ever has in the eight years we've been here. The improvement when we changed to Dr. Jack's was so quick (within a month or two) that it seemed like magic. Craig is our service man and has given us so much information that has been helpful. He is so professional and courteous and friendly. Kelly in the office is most helpful as well. We're just very happy with Dr. Jack's." "It was our lucky day when we found Dr. Jack's. Their expertise is amazing, the staff is wonderful and our lawn gets plenty of TLC from Mike, our outstanding technician. Mike is professional, knowlegeable and takes care of all the details, as well as keeping us informed on all aspects. Who could ask for more?" "My yard is beautiful, thick, and green thanks to Dr. Jack's good care. They even noticed insects in my grass while they were at my neighbor's house and sprayed my yard, too. The technicians answer all my questions. And the price hasn't changed in seven years. Thank you, Dr.Jacks!" Ready to take back your territory from pests? Please submit one of the forms below to start a new service request. Please provide us with a few details below and one of our team members will be in contact within 72 business hours.